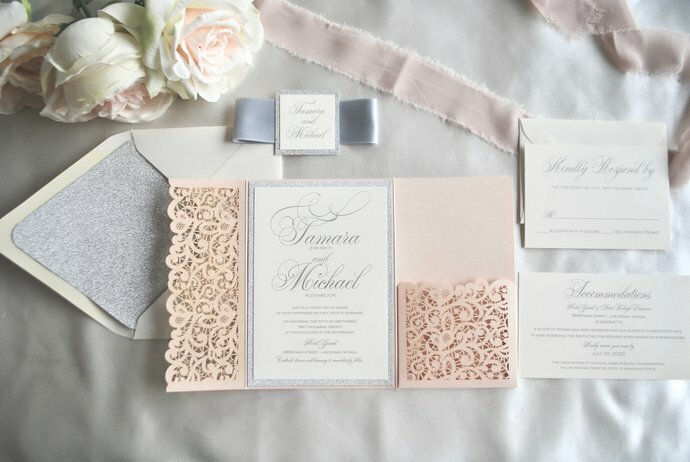 Metallic Soft Blush lace laser cut pocket Invitation measures 5X7. Invitation is enclosed with a satin silver ribbon and monogram tag. Invitation is printed on Cream cardstock and mounted on Silver Glitter cardstock. 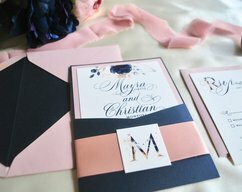 Inserts include RSVP and Reception card. All are printed on Cream cardstock. 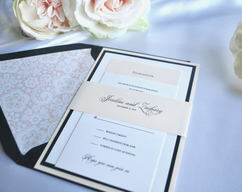 Cream Outer Envelope is embellished with a Silver Glitter envelope liner. 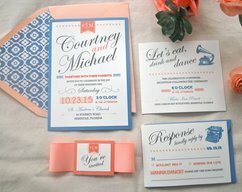 RSVP envelope is seen in Cream. 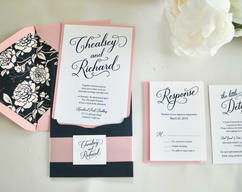 COMPLETELY CUSTOMIZABLE WITH YOUR COLOR THEME AND WORDING!!! 1)	To place order, please purchase deposit option in this listing or contact me. A non-refundable $100 deposit will be required to get the proof process going. Deposit will go towards your final amount. You may also place full order. If placing full order any add-ons such as liners, envelope printing, additional inserts, upgrades and shipping will be added once approval of proof. 2) Once order has been placed, a form will be sent to gather your details. If you wish to change wording or color scheme, color palette chart and wording choice list will be sent. 3) An electronic proof will be sent within 3-5 business days after completed form has been received and accepted. 4)	You will have up to three rounds of proofs to send me corrections before they are printed. 5)	Once final proof is approved I will post another reserved listing for the remaining balance. 6)	After payment is received, I will begin production. Production varies from 3 - 4 weeks so approving proofs in a timely manner will speed up your order greatly. 7)	Shipping prices will be added to your final payment. 8)	Your invitations will be shipped to the Payment address unless you request otherwise. If you have any questions please convo me or check my policy page. All Designs, copy and photos belongs to Out the Box Creative Â©. Please respect the nature of design and the creative process.